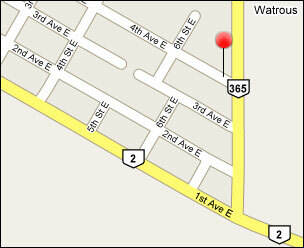 Our Offices & Shop are located in the Watrous Industrial Area at 708 4th Ave. East., at the corner of Hwy #365 & 4th Ave. East. Here is an interactive map to show our location in the province... you can zoom in to the exact position. Copyright © 2012 Melron Services - Watrous, Saskatchewan, Canada. All rights reserved.